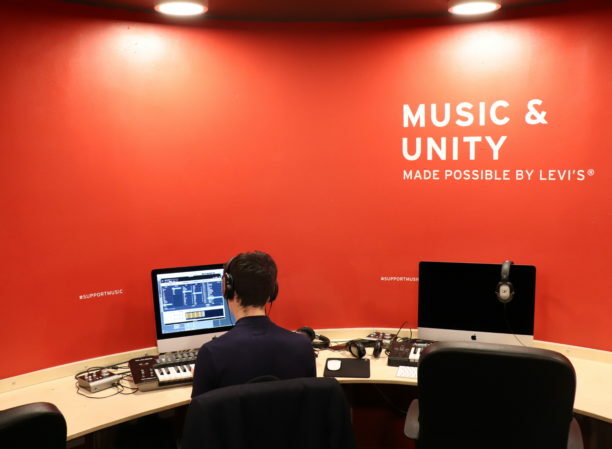 The Levi’s® Music project and Z-arts are proud to announce the first of our FREE masterclasses at our purpose-built music studio at Z-arts in Hulme, Manchester. On Saturday 27th April from 12-5pm we are holding a Music Production masterclass alongside acclaimed producers METRODOME & GLUE 70. Both guests have vast knowledge and experience in music technology and are known worldwide for their distinctive contributions to electronic music. We will explore technical skills in creative music production, vocal manipulation and mixing. There will be an opportunity for a Q&A and time for reflection and advice on your music. This is an incredible and unique opportunity to work alongside industry professionals and with other creatives. Please only apply if you are already confidently making music. For beginners, check out what’s on offer here. We run regular free drop in sessions for all abilities. If you are aged 16+ and would like to take part in this project, download the form from the link below and return it completed by Friday 5th April 5pm to jack@z-arts.org or by post to Z-arts, 335 Stretford Road, Hulme, M15 5ZA. We will you know if your application has been successful by Monday 8th April 2019.